BoInk through week 12. 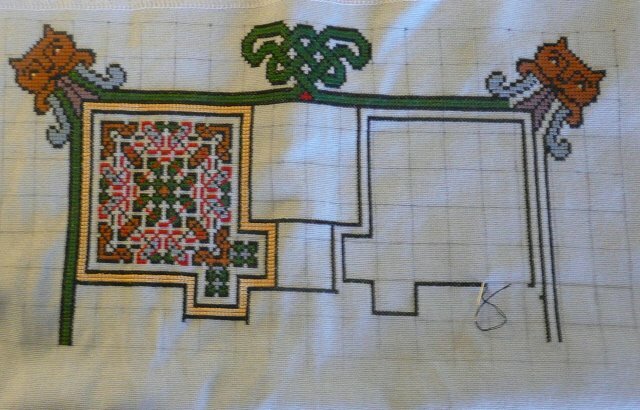 I’ve almost finished the fishtail border of Motif #2, and now have spaces for 2 interior motifs. Looks like I’m stitching in green this weekend! This is my current Round Robin piece, round 6 of the 3 Ladies. This piece belongs to Pixie. Can you see my dilemma? Look closely at the top of the pic, maybe I cropped it to much, but those white stitches are in fact the binding stitches at the edge of the fabric. 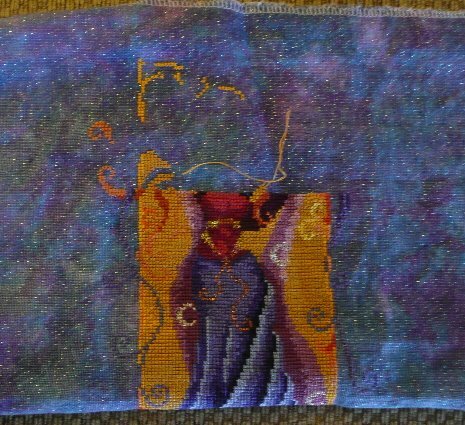 She started her piece to high on the fabric, and I’ve discovered there’s less than 1.5″ left. The yellow stitches represent the top of my section, with several more rows to go. 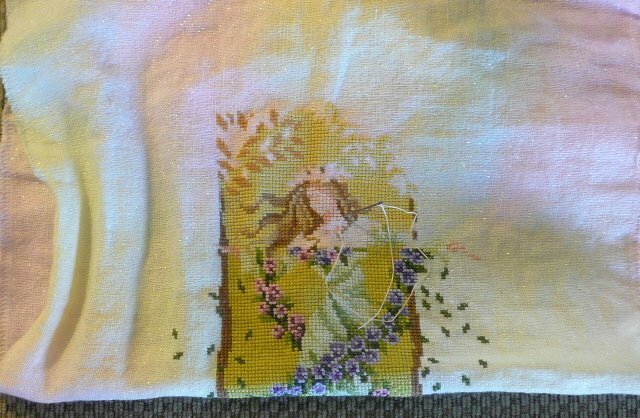 This is why I have little mojo on this piece, I’m not sure whether to continue stitching or not, and neither is Pixie! Since Pixie’s been so busy with college and life in general, she asked if I could keep her round 6 – I don’t mind stitching more on this one, and I’m making good progress on it. I’ve been stitching on it almost every day this week. This is either Rebekah’s or Vanessa’s – there’s no name on the bag. I’m still enjoying it a lot, the colors are easier to see on this fabric than on the dark blue. I’ve stitched everything above the crease. No dress pictures yet. I’m still sewing, I hate the sewing machine. Have I mentioned before that I hate the sewing machine? But I hate the way I look in shorts more, so making dresses it is. The second lady, The Earth Goddess should be mine. She's looking fantastic!